Twelve months a year with peaks in spring and fall. Perennial artichokes will be rounded with a soft green color in the late winter and spring. In the summer and fall these artichokes will be more conical in shape, a darker green with some purple at the base, and slightly flared buds. Other annual varieties will be mostly rounded all year and vary in color from purple to pale green. Some varieties will be thornless. Outside leaves may be bronzed due to frost. Look for tender green on the inside of petals. The discoloration is cosmetic only and does not affect the edibility. All sizes are mature and sold in 22- to 24-pound cases with a count size per case; #12, #15 and #18 (jumbo); #24 and 30 (large); 36 and 48 (medium); and 60 (small). Baby artichokes, large and small, are not counted but are packed by weight. Do not wash. Refrigerate at 33° to 34° F., 99% humidity. Wash under cold, running water. Pull off lower petals and cut off stems. 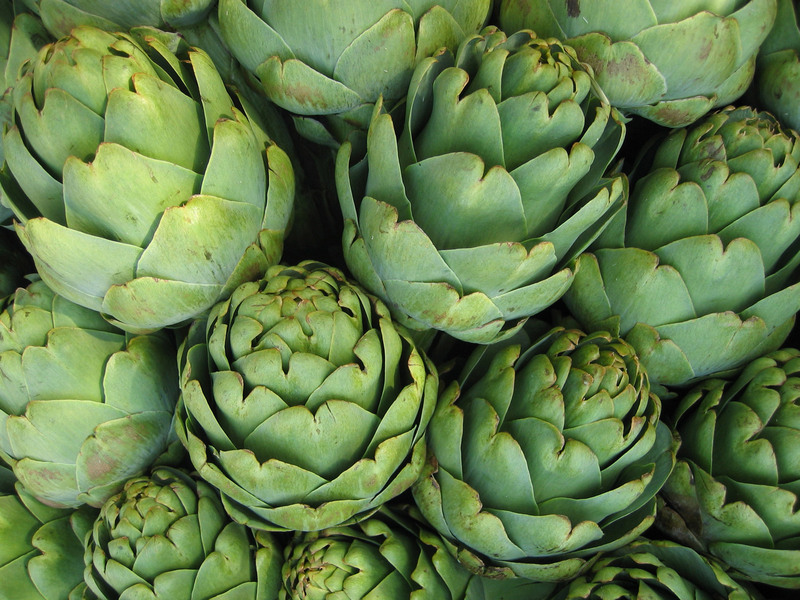 Alternately, trim the bottom of the stem to viable portion, peel and retain on the artichoke. Slice off top quarter and trim petal tips, if desired. Dip in acidified water to preserve color. Place on rack over 1½ inches boiling water. Sprinkle generously and salt. Cover and cook 25 to 40 minutes. Test for doneness as above.